Lehmbruck studied art and sculpture at the Schools of Arts and Crafts in Dusseldorf and at the Dusseldorf Art Academy in his native Germany before moving to Paris in 1910. There he befriended avant-garde artists including Alexander Archipenko, Aristide Maillol, Henri Matisse, Amedeo Modigliani, and Pablo Picasso. Under their influence, he transformed his style from the academic, highly traditional approach he had practiced in Germany to a more spiritual mode characterized by angular, attenuated figures that express a sense of melancholy and uneasiness. 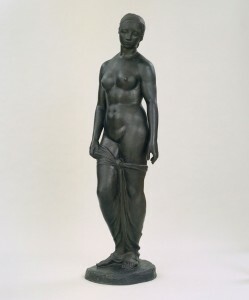 Standing Female Figure reflects Lehmbruck’s traditional manner. Kneeling Woman, which was also in the Armory Show, dates from Lehmbruck’s time in Paris and shows the radical shift his style underwent there.